A: I stay away from adult SCI-FI. I have read a few YA books that have a touch of SCI-FI in them but I don't really enjoy anything that's full blown Science Fiction. I also am not a fan of Romance. I love contemporary Romance but anything with Fabio or half naked girls on the cover is not for me. Q: Buy or Borrow: Where do your books that you read come from? The bookstore? The library? Do you prefer to own a book, or have it on loan? A: I'm a book buying kind of reader. I don't really borrow books from friends or the library(though I'm sure my bank account would appreciate that a little more!) When there is a book out there that I want to read, I 99% percent of the time buy it. The majority of my books come from Authors/Publishers and from myself purchasing them. Interview with a Blogger is back! Click HERE to learn more and to sign up! Under the Same Sky by Genevieve Graham. Check out the top of the right sidebar to enter! With GFC leaving in March, here are some other places you can find me and stay updated on The Crazy Bookworm. Old follower! I completely agree with you and the half naked Fabio romances, lol! 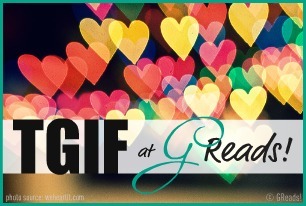 Here is my FF: http://theonceandfuturelibrarian.blogspot.com/2012/01/follow-friday-4.html - while you're there, check out my giveaway for a copy of New Girl by Paige Harbison! I have a hard time getting into Sci-Fi also. I don't mind urban fantasy and paranormal, but for some reason I just can't do aliens...lol. I buy the majority of my books too. I'm REALLY picky about the condition I keep my books in so I rarely loan or borrow and I don't really use the library (although I don't have any real reason not to). Awh man, I love me some Fabio romance! Actually I like paranormal romance better lol. I can read some sci-fi but not usually. Just hopping by, have a happy Friday! I'm with you on adult sci-fi. The only novel I've liked from that section of the bookstore was Enders Game.